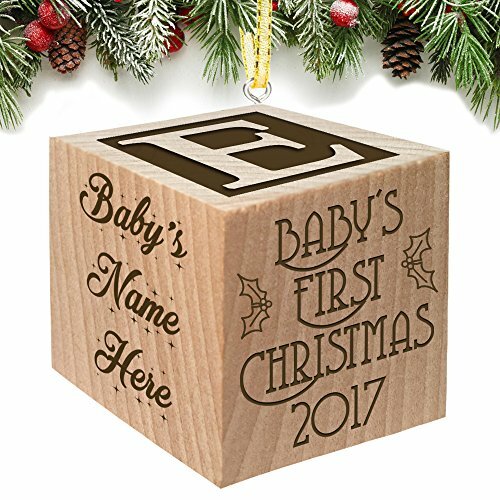 Celebrate Baby's First Christmas 2017 (or any other year) with family and friends with our unique personalized baby Christmas Ornament. Baby Block Made with sustainable wood, makes the perfect baby gift. This fully customizable wooden block allow you to show off your precious newborn with your families. Create a cherished keepsake with your baby's name, to create a truly stunning gift that your family will love. Baby's First Christmas details will be laser engraved into our exclusive customizable wooden block by Glitzby. This baby keepsake is a special way to remember the details of your baby's big day that will be cherished for years to come with this personalized gift. Also makes a great Baby Shower Gift. Size: 2" x2" to show off this priceless personalized gift for your child's special memories, it's a Memory gift you will treasure for a lifetime. Custom Personalization is included : Please provide your personalized details in the yellow custom now tab Brought to you by the crafters at Glitzby, made in the USA. Ultra fast turnaround and shipping. Includes personalization, Eyehook and Ribbon: Click on the Yellow custom tab at the right or top. If you have any questions about this product by Glitzby, contact us by completing and submitting the form below. If you are looking for a specif part number, please include it with your message.